Russian and foreign paleogenetics extracted DNA from the remains of ancient people found six years ago in Denisova cave in the Altai, and found that some of them were “hybrids” of Neanderthals and “Denis”. Their conclusions were presented in the journal Nature . “We knew before that Neanderthals and Denisovites had to contact each other and leave offspring from time to time.On the other hand, I personally never thought that we would be so lucky and we will find the remains of a child whose father was a Denisovian “and the mother is a Neanderthal woman,” said Vivien Slon of the Institute of Evolutionary Anthropology in Leipzig, Germany. In December 2010, the famous paleogeneist Svante Paabo announced the opening of a “third” species of people whose remains – one knuckle of their finger – were found in the Russian Denisova cave in the Altai. This discovery was made thanks to the “resurrection” of fragments of the genome, preserved in three fragments of the bones of an ancient person – a phalangeal bone of the finger and two teeth found in the cave. As scientists initially believed, the “Denis” they found were the relatives of the Neanderthals, who lived in a cave about 50,000 years ago. Later it became clear that the “Denis” had emerged much earlier than scientists had assumed, and were a separate subspecies of people. Traces of their DNA remained in the genomes of modern Polynesians, Indians of South America and a number of peoples of Southeast Asia. Paabo and his colleagues, including academician Anatoly Derevyanko and Mikhail Shunkov from the Institute of Archeology and Ethnography of the SB RAS, found in the Altai cave not only the teeth from which the “denisovets” gene was extracted, but also two thousand other bones allegedly belonging to the Neanderthals. Scientists gradually analyzed these remains, extracting DNA from them and comparing them with the genomes of other ancient people. In one of these bones, “Denisova 11”, which belonged to a 13-year-old teenage girl, who died about 90 thousand years ago, they were in for a big surprise. On the one hand, snippets of mitochondrial DNA, transmitted from mother to her children, indicated that the owner of these remains was a Neanderthal man. On the other hand, when scientists resurrected the rest of the genome of this girl, they found traces of both Neanderthal and Denisov DNA in approximately the same proportion – 38% and 42%. Comparing pairs of chromosomes, scientists found that in most cases, one of them contained only the genes of Denis, and the second – their Neanderthal analogues. This indicated that the parents of this girl belonged to different kinds of ancient people, and were not “hybrids” like herself. Accordingly, her dad was a “Denis”, and mother – a Neanderthal woman. Her parents, as noted by Paabo and his colleagues, could boast of an unusual story of life and origin. For example, the girl’s father was not a pure “Denis”. In the distant past, 300-600 generations ago, his ancestors had already made contact with the Neanderthals, which left small inclusions of their DNA in his genome. The mother of the girl, in turn, turned out to be an “immigrant” – she was closer to the arrangement of DNA to the Neanderthals living in the Croatian cave of Vindia than to the Homo neanderthalensis, who lived in the Altai and Central Asia. 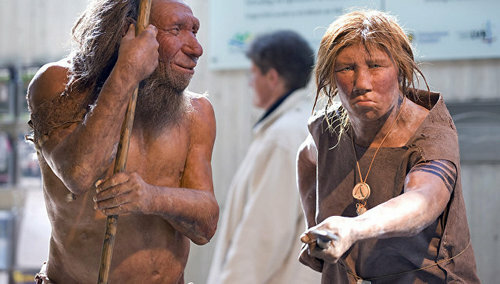 “Of course, Neanderthals and Denis people lived in different regions of the Earth and they were more likely to encounter each other, but when such meetings took place, these people, it seems, often entered into contact and left offspring – much more often than we thought before “, Concludes Paabo.